Shockwave Therapy is a non-surgical office procedure to help heal painful musculoskeletal conditions and accelerate the recovery of injured tissue. Also referred to as Extracorporeal Shockwave Therapy (ESWT). 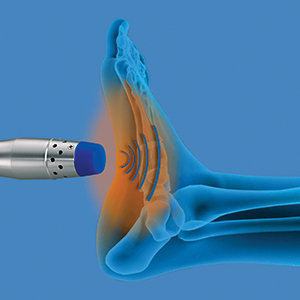 ESWT (Shockwave therapy) is a non-invasive alternative to surgery for pain from many common conditions. Shockwave treatment uses pressure waves focused on the site of the pain or injury to stimulate the body’s own natural healing mechanisms, “jump-starting” the healing process. It may also help to heal damaged tissue. Shockwave is useful for heel pain from plantar fasciitis and Achilles tendinitis, carpal tunnel syndrome, LBP, trigger finger, calves and hamstring tightness, Morton neuroma, patellar tendinitis, lateral epicondylitis, neuropathies and shin splints. ESWT can also be used for indications other than MSK (ED, stretch marks, cellulite). The safety of this procedure is proven. If done by a qualified provider, the procedure has virtually no risks or side effects. Since there is no medication, surgery, injections, or anesthesia administered, complications are extremely low. There are a number of benefits to Shockwave treatment. It is a non-invasive procedure—which means there is no cutting of the skin. This means no time out of work or down-time following the procedure. Shockwave is also relatively inexpensive, especially when compared to the cost of surgery. There is no post-treatment pain medication needed, and the treatment is fast, safe, and effective. Generally 3-6 treatments are performed on a weekly basis, and each one takes approximately 10-30 minutes, depending on the area treated, the amount if inflammation and the goal of treatment. It can be performed in a standard treatment room and no special pre-treatment medicines or preparations are necessary. No anesthesia is required, and most individuals tolerate the treatment well. Shockwave might not be covered by insurance. If this is the case for you, your insurance will not be billed for the Shockwave treatment, and payment is due at the time of treatment. All office visits to the physician will be billed directly to your insurance.